Pictures of you cars are always welcome. Car insurance for modified cars. 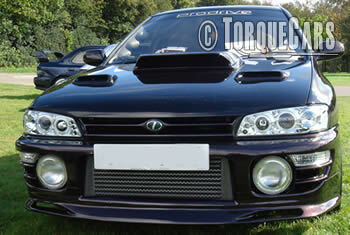 Extreme auto acessories also have some great value performance & styling parts. Question: I've added a sports exhaust and Air filter what should I do next to boost the power without spending too much money? Answer: Fit a fuel pressure boost valve - about £100 for more top end power and driveability with a faster throttle response or go for fast road profile cams £200 + Fitting . Question: i have a subaru legacy 2.5 awd, where i work and own the car they don't have catalytic convertors as stsandard so i wish to find a supplier of a full free flow exhaust system including headers,also i wish to upgrade the engine and brakes and i wish to know what options I can take. To ask a question or offer a tip click here to access our new chat forum. Use of this site: Please treat the information on this site as purely speculative – the articles are contributed and we are unable to verify the accuracy of them. We accept no responsibility for damage caused due to following a recommendation made on this site. It is your responsibility to check and verify any article with a qualified mechanic before undertaking work or following instructions. Something suitable for one model of car may be completely unsuitable for another – so we can only give generic theory hoping to appeal to our wide audience. We particularly advise caution following comments made in the forum – the 12 year experienced mechanic offering advice could turn out to be a 13 year old lad with a car magazine as his knowledge. Please drive sensibly we do not endorse speeding on the public highway or driving recklessly or in a manner than could endanger life or property. Save racing for the track and keep the roads safe. This is our old site - click below to visit the new one!